I've added some notes to the SSN page to explain the source of the SSN information a little better as I've had a couple of emails requesting the use of other SSN values. Recommendation ITU-R P.1239-3 states "The sets of numerical coefficients defining the diurnal and geographical variations of the monthly median of foF2 and M(3000)F2 are based on a linear relationship with solar activity". In this case, solar activity is characterised by the value of R12. Note that the coefficients are used to determine a statistical median value for a month, the type of information of use to a link planner, as opposed to an absolute figure of foF2 at an exact time and specific value of SSN. This also indicates the importance of using a monthly smoothed value, the tables being used to provide monthly median values of foF2. 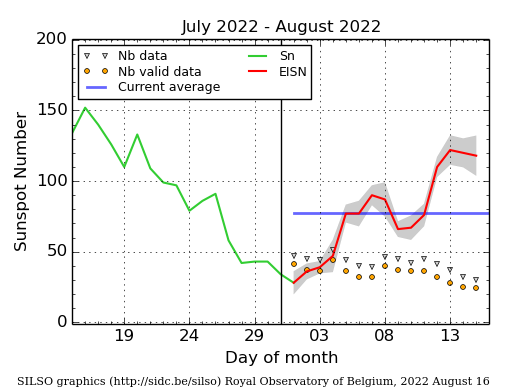 The SSN values are read by a small script from http://sidc.oma.be/silso/FORECASTS/prediSC.txt at the start of each month and reformatted as a JSON file for ease of access. At the moment I'm running the script manually but will set up a cron job after a couple of months after I've got a handle on the how close to the start of the month the updated SSN values are available. The SIDC Figures used on the help->SSN page are currently only accessible from the SIDC servers via HTTP. For users accessing proppy via https, the inclusion of mixed content could cause a privacy concern so the site is currently using locally saved copes of the images. The copies are made daily (Figure 2) and monthly (Figure 1) using wget/cron. If the SIDC move to support https I'll link directly to their servers.